This map displays territory of Finland. detailed map of Savitaipale 1 cm to 1 km free download. actual map of Lemi for you. 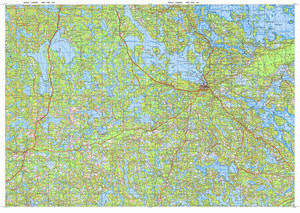 map of Suomenniemi calibrated this. interesting map of Viuhkola и OziExplorer calibration here. topographic map of Vitsainen и OziExplorer calibration for Garmin. topographic map of Virmajarvi 1 cm to 1 km for you. interesting map of Viisari 1 cm to 1 km presented. topographic map of Viiru with gps calibration presented. free map of Vartola 1 cm to 1 km for gps. free map of Vanonen и OziExplorer calibration displayed. detailed map of Valtola with gps calibration presented. interesting map of Valkolanmaki here. free map of Valijoki for Garmin. topographic map of Vainikkala with gps calibration free download. actual map of Uutela 1 cm to 1 km this. interesting map of Uusi Mauno presented. detailed map of Urola with gps calibration presented.